Not getting anyone to respond to your link outreach emails? Here’s a look at why they may be failing and what you can do to improve your open rates and ultimately your link counts. We all sometimes make a typo that omits or changes a letter in a word. A typo like that is difficult to spot when the mistake is still an actual word (or words). Just last week, I wrote “head lice” instead of “headline.” Again, two completely different things. 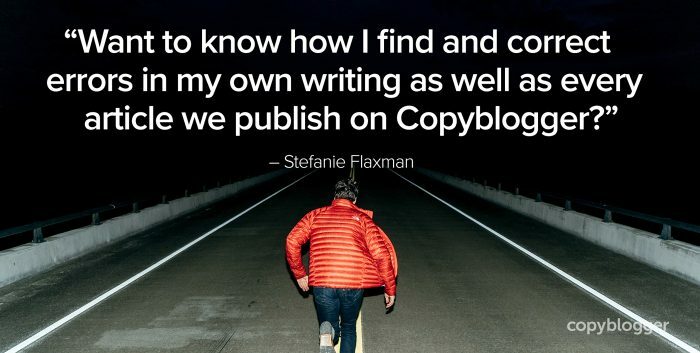 Do you want to know techniques I use on my own writing as well as every article we publish on Copyblogger? I’ve witnessed two different attitudes when it comes to how people feel about typos. Some find them unacceptable and a reason to stop reading a publication. Others aren’t bothered by them at all and don’t understand why anyone would make an effort to prevent them. I’m sure you’re not surprised that my outlook falls in the middle between those two extremes. I walk the line. It’s a bit excessive to call a website “untrustworthy” if there is a typo in a piece of content or if an author doesn’t strictly follow grammar rules, but publishing your writing with a number of mistakes isn’t wise either. It can even lead to customer service headaches. Established publications might be able to “get away with” occasional typos. Their audiences (for the most part) will be forgiving. But if your website isn’t well-known and trusted yet, you want to demonstrate that you treat your content with care and aim to create the best possible experience for your readers. Try one of the three methods below when you’re ready to polish your writing before you publish it. For this first method, you’ll need an opaque object that you don’t mind holding while you proofread. It could be a note card, your phone, a slab of smoky quartz … whatever is handy and near your desk. Speaking of “handy,” your hand also works as this “object,” if nothing else feels right. Start at the beginning of your text and cover the second word with the object so that you only concentrate on the first word in the document. Once you make sure it’s the correct word, surrounded by the correct punctuation if any is needed, shift your focus to the second word and cover the third word with the object. When you’re satisfied with the second word, cover the fourth word with the object, review the third word, and repeat until you reach the end of your draft. Blocking out the next word in your text forces you to slow down and examine your writing with a critical eye. Names of companies, products, and people will stand out so that you can fact-check them. You’ll also be able to quickly see if you’ve accidentally left out a word, repeated a word, or chosen the wrong word. I like proofreading with this retractable pen because when the ink cartridge is inside the external frame, a spongy material becomes the tip of the pen. The spongy part can make contact with my computer screen without scratching it. You can use an eraser on the end of a pencil, a cotton swab, or another pointed object that is soft. Start at the beginning of your text and physically underline each word with your soft, pointed object as you proofread. My pen actually touches my screen and presses into it as I observe each letter and word. You don’t need to spend more than a few seconds on each word — just enough time to give it your full attention. You’ll be able to easily spot “you’re/your/you” and “their/they’re/there” mistakes. Focusing on each letter of a word also helps you notice if you’ve accidentally made a word plural when it is supposed to be singular, or vice versa. After I edit and proofread an article, the review process still feels a little incomplete — mistakes could be hiding in the content. So, the technique I use as a final step before publishing is reading from the last sentence to the first sentence. No matter how many times you’ve already reviewed an article, proofreading in this way helps you, at the very least, identify weaknesses you may have overlooked while editing. During this stage, I sometimes notice a word has been overused or a lot of sentences begin with the same word. I’ll then vary the language so the text is more interesting. Read from the end to the beginning with either of the methods above to give every detail of your content extra special attention. Your job is to verify the accuracy of the words and phrases you present to your audience. When I discovered content marketing, I loved the concept but didn’t think it was something I could do. Writing on a regular basis seemed like an impossible goal. Since I’m an editor, I thought an accidental writing mistake would tarnish my reputation. I couldn’t risk it. Do you see what was really going on? I was lacking confidence at the time. A confident person feels good about the work they’ve carefully produced and realizes mistakes still sometimes happen anyway. With digital content on your own site, it’s especially easy to make corrections and move on. So now that you’re equipped with smart ways to proofread, what are you going to publish today? Image source: Joshua Ness via Unsplash. The post 3 Proofreading Pointers, So Your Writing Isn’t Shared for the Wrong Reason appeared first on Copyblogger. Content Marketing is a hot topic, no doubt. What you may not know, however, is that it’s been around for a long time, and that it’s finding itself in the midst of yet another “Golden Age” with the rise of the Internet. This is very good news if you’re a content creator. It’s even better news if you’re building authority online. But, are you actually getting the job done? Whether you have no idea what I’m talking about, or you do, and you’d like to take your content marketing skills much further online, we’ve got your back. Don’t ignore one of the most powerful forms of marketing of the last 100 years, sign up for MyCopyblogger today, and take advantage of months of valuable free marketing education.